Larry Flynt’s Hustler Club in Las Vegas is known for bringing in famous adult film stars to dance and flirt with visitors, but on August 25, they’ll have a different sort of entertainment. 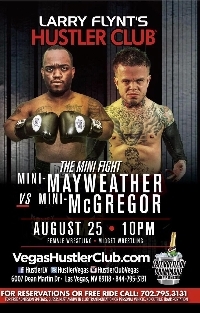 On the night before the super-fight between Conor McGregor and Floyd Mayweather, the club will host a face-off between a Mini McGregor and a Mini Mayweather. You are able to join virtually the excitement of MidgetMania - Mini Mayweather vs Mini McGregor. Watch a high quality LIVE video stream brought to you by Rocket Surfing Productions. Enjoy, interact and watch the live feed from any of your internet connected devices. On Aug 25, 2017 22:00 PDT to Aug 25, 2017 23:55 PDT you will come back here and watch the show LIVE!! The rocketsurfing team will be providing a video on demand replay of this event within the next 24 hours after the completion of this event to watch at your convenience. On behalf of Rocket Surfing Productions Cleeng teams provide support before, during and after the event. Due to high traffic just before and during the event, critical requests will be handled first, so please moderate your questions and only send if very urgent. Please try not to send multiple requests.